Music licensing can cost a pretty penny, and oftentimes that's a big hurdle to cross for independent filmmakers. However, Foo Fighters, Gaslight Anthem, Cary Brothers, and Staind guitarist Mike Mushok have all given the filmmakers behind the 'Beach 119' Superstorm Sandy documentary short a break as they donated their music free of charge to the project. The Foo Fighters' song 'Home' is featured in the over 13-minute short, with Gaslight Anthem's 'National Anthem' and Cary Brothers' 'Take Your Time' also used in the film. Mushok, meanwhile, provided original music for the piece, which was written by Shannon Simpson Bevins. 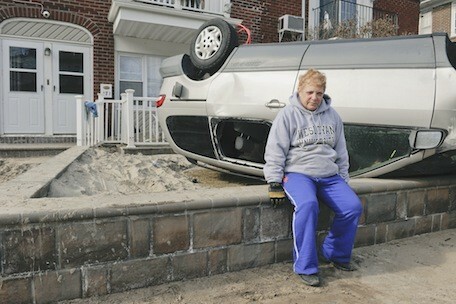 The 'Beach 119' documentary short centers on the challenging journey of neighbors on Beach 119th street as they deal with the tragic devastation of Superstorm Sandy. Located in the Rockaway Peninsula and nearly 24 miles from Manhattan, the street was cut off from power, heat, gasoline and water for weeks after the storm. In times of tragedy, the neighbors banded together to survive the ordeal and comfort each other through their struggles. "I spotted desperate pleas on social media from dying cell phones in the hours after the storm made landfall. People were cut off from help. No gas, transportation, electricity, food and, in some cases, clothes and imperative medical needs," said co-director Marcie Allen. "This documentary is to give these survivors a voice to tell their story. 'Beach 119' is a story of humanity. Strangers came together in a time of need." For more info on the documentary, check out Beach119.com, and be sure to watch the 'Beach 119' short below.